To continue work on our teaching aid we are looking for investors, sponsors and partners. Of course, your private donation is warmly welcomed. Use the form below to help us change education for good. Sign up for our newsletter, today. We keep you informed about the current status of GlobalCitizen Adventure and we even send you relevant content for you to use in your classroom. Become a GlobalCitizen today and push us forward with a donation. To bring GlobalCitizen Adventure to your school as soon as possible we depend on sponsorships. Simply follow us on Facebook to stay in the loop. We are constantly posting topics in our target subjects, which are education, nature & technology, geography as well as history & culture. Simply follow us on Instagram to stay in the loop about our teaching aid’s progress and have fun with quotes on education and learning. Great intentions lead to great ideas. GlobalCitizen Adventure is our learning and teaching software which will soon be available for purchase and use in your everyday classroom. Since months we are working so hard to deliver a brilliant piece of software with the intention to bring our learners’ consciousness closer to the place we live in: our globalized planet Earth. Certainly, we do not mean to lock your learners up in front of a screen. The GlobalCitizen Adventure wants them to go out and explore, with some kind of modern research compass at hand. Speaking of screens: today, we are using them every single day. In fact, most of us could not live without them anymore. So, why don’t we start using our devices to the limits of their capabilities? We want learners to explore and consequently learn at their own pace. We don’t want anyone to slow down or speed up just for the sake of reaching some learning objective at the same time as everyone else in the classroom. GlobalCitizen Adventure is totally about true individualization. Yes, we really figured out how to make this a reality. It’s time to change a system which has been left unchanged for decades or even centuries. We are taking over responsibility to improve teaching long term so that there is more space for individuality and creativity, even in school subjects that are not famous for encouraging learners to be creative: “Natural Sciences & Technology” (Biology, Chemistry and Physics), “Geography” as well as “History & Culture”. Who and what is GlobalCitizen? 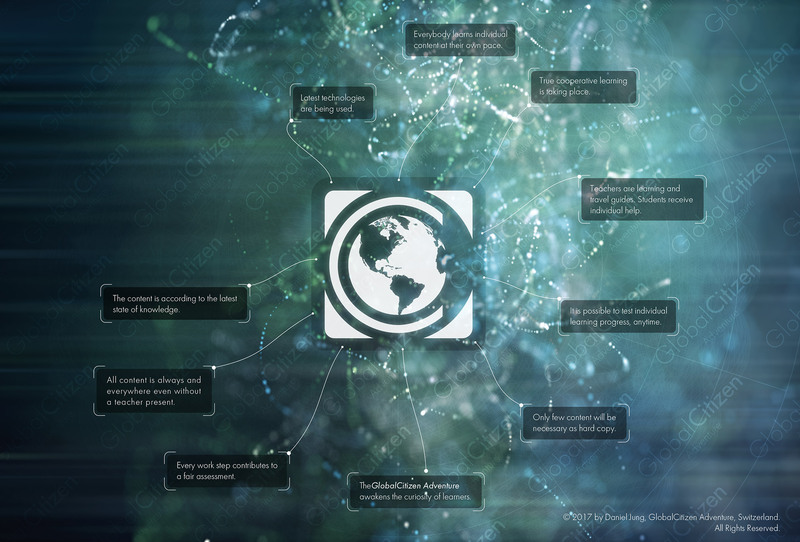 Everybody involved in the GlobalCitizen project has either a background in eLearning, teaching (adults and children), coding, graphic design or in any of these. We are absolutely committed to enhance every teacher’s everyday experience with computing devices, whether they are mobile or not. My goal is to deliver the most modern learning materials to all the young learners because they really deserve it. And by arousing a sophisticated teacher’s tool we free the teachers from the myth of being omniscient. This will allow them to truely accompany their students on a learning journey. Our education system really matters to me, and I am convinced that a change in how we teach can lead to raising more creative and prosper citizens. Subscribe to our newsletter, now. We will never spam you. Regardless of whether you are a teacher or not, our email newsletter comprises true and worth knowing content for everybody. Support GlobalCitizen as a sponsor. While we are still looking for a major sponsor or partner, you can make a difference with your donation, too. It will definitely give us a boost in making a change in education and it lets us push more of today’s boundaries of learning and teaching software. Though we are located in Switzerland we chose Euro as an international currency. Are you an investor looking for a future-oriented and dedicated startup? Please contact us using the contact form below or don’t hesitate to give us a call.